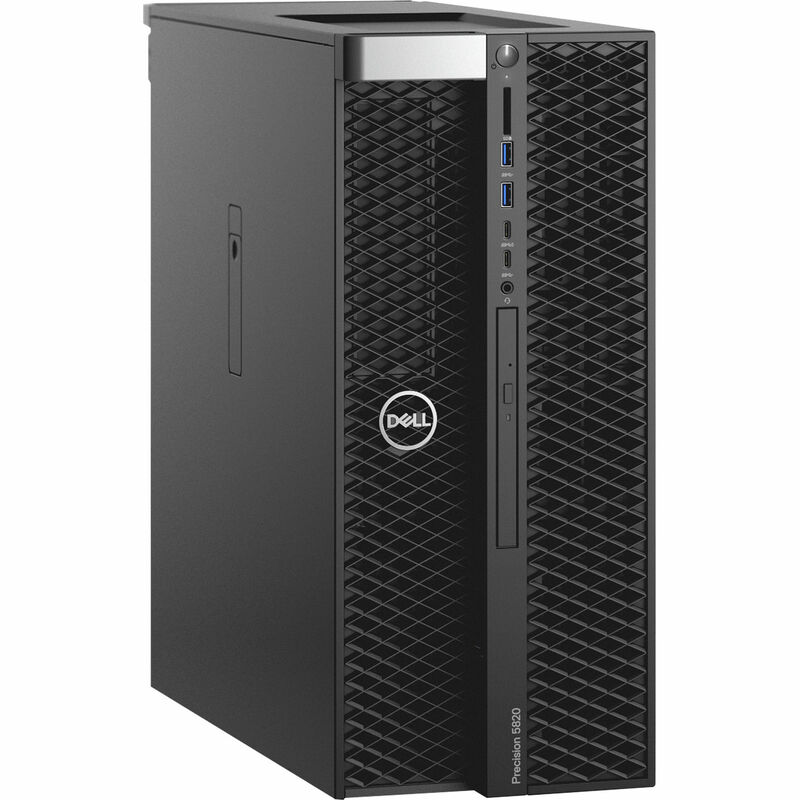 Built to handle complex projects, including virtual reality workflows, the Precision 5820 Tower Workstation from Dell is powered by a 3.6 GHz Intel Xeon W-2123 Quad-Core processor which will allow you to run multiple applications simultaneously. If more power is needed, the CPU can deliver extra performance by increasing its clock speed up to 3.9 GHz utilizing Intel's Turbo Boost 2.0 technology. There is also 16GB of 2666 MHz DDR4 RAM that comes in a 2 x 8GB configuration and can be upgraded to 256GB by using a 32GB module in each of the eight 288-pin DIMM slots. For storage of your files, this system is equipped with both a 512GB M.2 SATA SSD and a 1TB 7200 rpm SATA 3.5" hard drive. If you want to add external storage drives, optical drives, printers, memory card readers, or other peripherals, the 5820 features two 5 Gb/s USB 3.1 Gen 1 Type-C ports (front) and eight 5 Gb/s USB 3.1 Gen 1 Type-A ports (two front and six rear), one of which supports smart Power-on. There is also one serial port and two PS/2 ports. The dedicated NVIDIA Quadro P4000 graphics card has 8GB of GDDR5 RAM and delivers a sharp, clear picture while allowing for multiple simultaneous displays to be used via its four DisplayPort 1.4 outputs. Whether you are listening to music, watching a movie, or playing a game, the integrated Realtek ALC3234 audio controller outputs high-definition audio and delivers higher fidelity than standard audio controllers. Network connectivity is achieved using the integrated Gigabit Ethernet port, Dell's DVD±RW drive can be used to read from and write to optical media, and the integrated card reader supports UHS-II SD, SDHC, and SDXC cards. Dell's Precision 5820 Tower Workstation includes their KB216 USB keyboard, MS116 USB mouse, and a power cord. The installed operating system is Windows 10 Pro for Workstations (64-bit), which scales up for machines with a high number of logical processors and large amounts of RAM for server-grade hardware and power users. A 3.6 GHz Intel Xeon W-2123 Quad-Core processor powers your most demanding applications with its single-socket architecture. Run your software faster and get real-time results, thanks to 16GB of 2666 MHz DDR4 memory that can be expanded up to 256GB. Focus on your tasks with a workstation that's is quiet. A multi-channel thermal design delivers advanced cooling and acoustics for enhanced cooling and quiet operation when your system is under heavy workloads. Command your audio and video needs with an optional DPAI audio module capable of handling professional applications. Up to six 2.5" or five 3.5" drives and front access storage including SATA, SAS, and PCIe M.2/U.2 NVMe SSDs can be configured and easily swapped. With the hot-swap feature on the M.2 and U.2 PCIe NVMe SSDs, you can remove drives without shutting down the workstation. Enable increased storage performance with the optional Intel CAS-W cache acceleration solution for workstations. Free with your Precision workstation, the Dell Precision Optimizer takes the guesswork out of customizing settings and automatically tunes your workstation to run the most popular Independent Software Vendor (ISV) applications at the fastest speeds possible. Featuring centralized management with Microsoft SCCM and KACE, simplified systems management to improve system reliability, detailed analytics and smart notifications to proactively address resource bottlenecks, certified graphics driver downloads and Radeon ProRender ray-tracing plug-ins to render stunningly photorealistic images ― all in an elegant, new UI. Improve the availability of your data with hardware and software optional RAID storage options, including PCIe NVMe SSDs and optional Smart Card (CAC/PIV) readers that let you determine who can access your system. Box Dimensions (LxWxH) 26.5 x 24.0 x 11.5"
Can I configure the 16GB RAM to 32GB RAM? Can I configure the RAM of 16GB to 32 GB RAM?